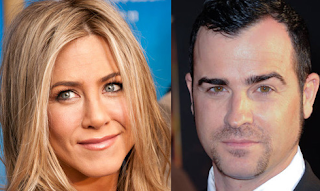 Jennifer Aniston and Justin Theroux get married after three year engagement. The couple exchanged vows in front of more than 70 family members and friends on Wednesday at their Bel Air, California, home, sources confirm to PEOPLE. "Guests were told it was a birthday party for Justin," says a source. "Jen and Justin wanted to surprise guests and guests were certainly surprised." The star-studded guest list included Friends pals Courteney Cox and Lisa Kudrow, as well as Chelsea Handler, Howard Stern and Beth Ostrosky Stern, Jason Bateman, Emily Blunt and John Krasinski, Ellen DeGeneres and Portia de Rossi, Will Arnett, Tobey Maguire and Jennifer Meyer, Lake Bell and Scott Campbell, Terry Richardson, Jimmy Kimmel, Billy Crudup, Sia, Kathryn Hahn and Whitney Cummings. Why, he doesn't even seems interested in her. Plus she looks like she's boring! I hope she's happy, but dude looks a tad fruity if you ask me. Her ex Brad has been bewitched by a succubus. I heard he became an atheist, b/c Angie insisted on it since she doesn't believe in God. All she does is collect children from different corners of the world to try and fill some personal void. He has to be in hell and regrets f*cking her. Last I heard he was playing with the nanny. I think their marriage has become a business contract.